UK loudspeaker manufacturer EM Acoustics has announced the launch of their all new website. 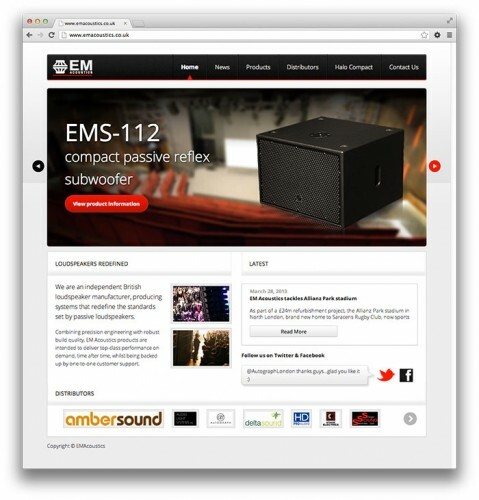 Featuring a brand new, modern look and feel complete with interactive links to social media such as Facebook and Twitter, the new site is designed to better reflect where EM Acoustics is today as a company. In addition to all of the existing product information, including of course all the data on EM Acoustics’ latest launch, the HALO Compact line array system, the new site will feature increased technical detail including 2D & 3D CAD drawings, as well as data for EASE, as well as EASE Focus 2 line array prediction software for the new HALO Compact system. An upcoming innovation will be a new Technical Resource section which will contain training videos, useful information and a FAQ section amongst other things. A complete news section, including live feeds from Twitter and Facebook is also included in the new website. According to operations director, Mike Wheeler, the new site marks yet another significant milestone in the company’s history. "I’m delighted that we’ve brought this project to fruition," he said. "It’s been a huge amount of work, but I think the results speak for themselves. Finally we are able to provide our customers with the tool they have been asking for – thoroughly modern, interactive and constantly evolving, the new website is designed to grow as we grow. We are able to offer our customers access to more technical resources than ever before as well as the ability to contribute content. 2013 is looking as though it’s going to be a year of major milestones for us in a number of ways, and so the timing for a new website and a new image couldn’t be better."